Thirty-five-year-old Thomas Matthew has told a horrific tale of how his father, who he claimed initiated him into an occult group, appeared to him and told him to sacrifice his children to him. In response to the demand, Matthew strangled his two-month-old son, John Matthew and four-year-old daughter, Mary Matthew at different times. But his attempt to also kill his first son, Josiah Matthew, who is nine years old, backfired. The Sunday Sun reports the horrendous acts were committed in Mountain village opposite Dantata Camp, Asokoro, Abuja. As Sunday Sun learnt from the Commissioner of Police, of the Federal Capital Territory Police Command, Mr. Mohammed Mustafa, the suspect, Matthew strangled his daughter, Mary, inside his house on October 7, 2016, after beating his wife, Bola, who is deaf and dumb and chasing her out of the house. When he spoke with Sunday Sun at the headquarters of the Criminal Investigation Department of the FCT Police Command, where he is being held prior to arraignment in court, Matthew corroborated what the wife said and made other disclosures in explanation of what drove him to commit the alleged heinous acts. “I got married to my wife, Bola, and we were blessed with three kids. My father is a cultist and he initiated me into the occult. My father asked me to offer the children as sacrifice and mark of honour to him, promising he would make me become rich. “It was a covenant that nobody knew, even my wife. My father gave me conditions that if anybody got to know or I revealed the covenant, that the covenant would be destroyed. From the time I had my first child, my father began disturbing me to offer my child to him as a sacrifice. 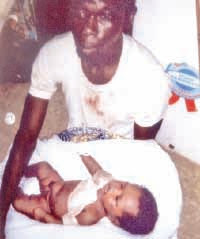 “I tried to kill my first child by strangling, but my wife caught me and reported to the police and her mother came to take the child away from the house. He has been staying with her in Mararaba, Nasarawa State. Later my father appeared to me after I had my second son, John, who became sick. I strangled him to death in 2015. On October 7, 2016, my father appeared to me again that I should kill my only daughter. 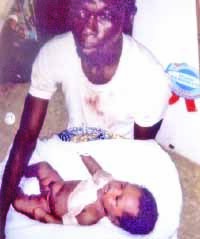 I was with my wife and then I started beating her and she ran away to my elder sister’s house and I locked the door and strangulated my four-month-old baby girl and she died. The police commissioner assured that the suspect would be charged to court soon.